California Sister (Adelpha bredowii eulalia) butterflies feed on rotting fruit, aphid honeydew, and only occasionally on flower nectar. I have never seen a California Sister at a flower, instead I've always seen these large butterflies either flying slowly through oak woodlands or sipping the salt and mineral-rich water at the edges of mud puddles or stream banks. This California Sister was sipping moisture from the damp sand along a small stream in the foothills of the Santa Rita Mountains south of Tucson. When they are "mud puddling", butterflies will often let you approach quite closely if you move slowly, and I was able to get some close-up photos of this very cooperative butterfly. 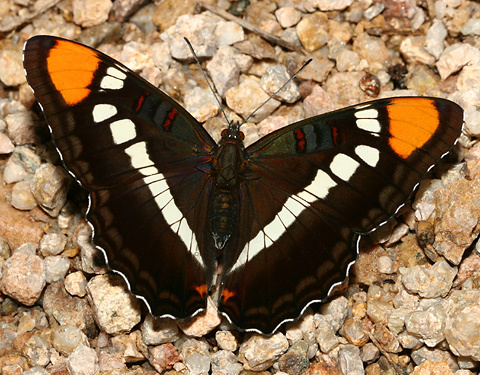 California Sister butterflies are dark brown above with large orange patches at the tips of the forewings, a partly discontinuous white stripe along both the forewings and hindwings, and a small orange spot at the base of the hindwings which is larger and more jagged in Arizona's California Sister. California Sister caterpillars feed on Oak (Quercus spp.) leaves, especially those of evergreen oaks like we have here in Arizona, and this is why these butterflies are usually found in oak woodlands.